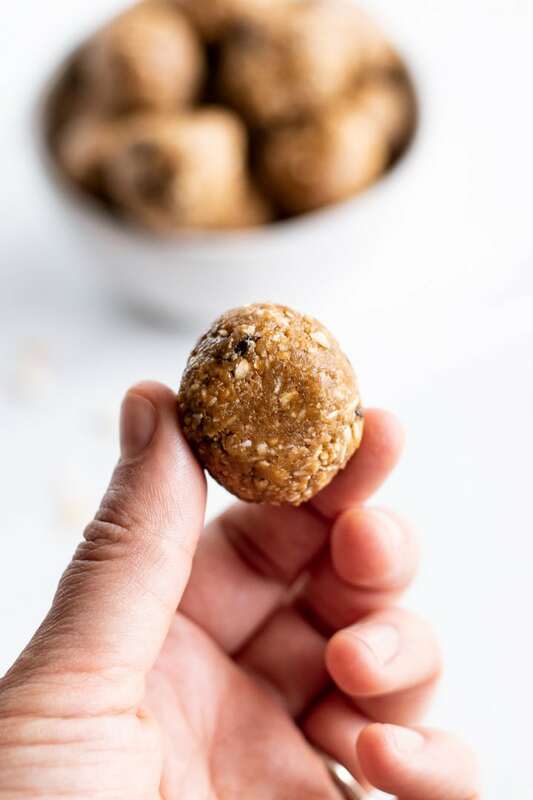 Another no-bake FODMAP-friendly snack option! 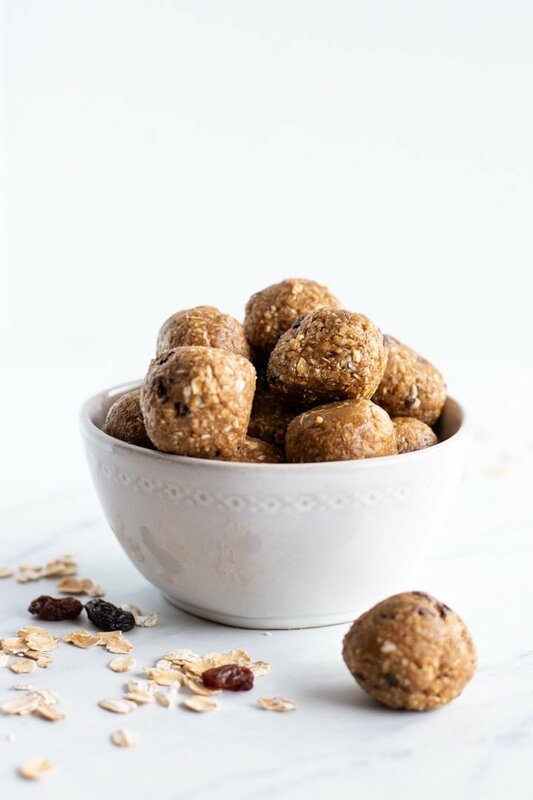 These easy-to-make Low FODMAP Oatmeal Raisin Energy Bites are a twist on the classic cookie combination with a boost of whole grain oats! 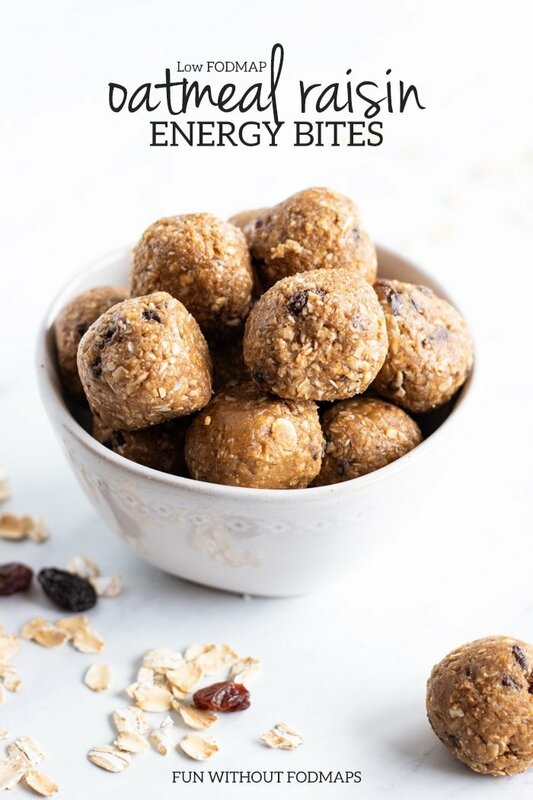 Another week, another no-bake energy bite recipe. YAY! Today’s version uses rolled oats, peanut butter, maple syrup, shredded coconut, raisins (Yes, raisins! ), and cinnamon for a yummy, whole-grain and FODMAP-friendly twist on the oatmeal raisin cookie. 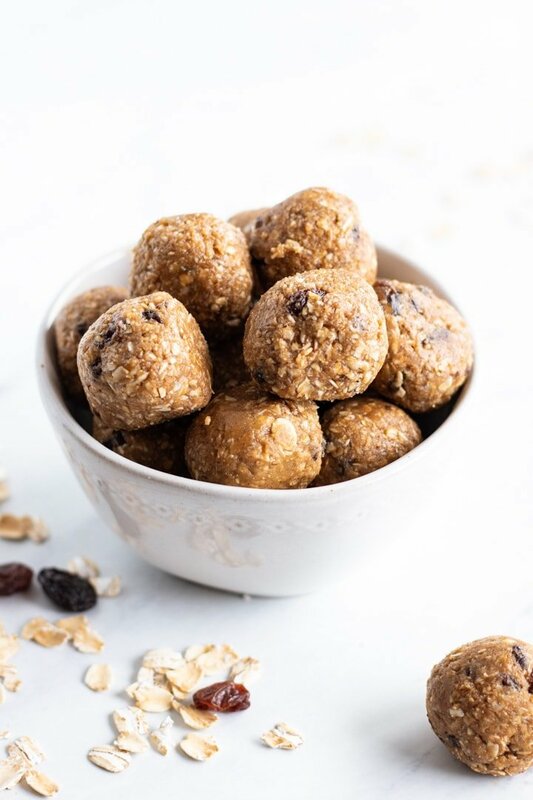 Although there are tons of energy bite variations out there, I like to use a food processor to help take away some of the “chew” from the whole-grain rolled oats. I also think it speeds up the process. Raisins are considered low FODMAP in small servings of 1 tablespoon or 13 grams. If you’re using the Monash FODMAP app (which is recommended), you may notice that raisins appear red or high FODMAP at first glance. However, this first glance rating doesn’t always tell the whole story. If you click into the raisin listing, you will see that in addition to a high (red) FODMAP serving size, there are moderate (yellow) and low (green) FODMAP serving sizes, as well. 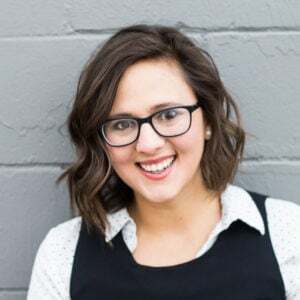 As the recipe is written, most should be able to tolerate 1-2 bites at a time during the FODMAP elimination phase. 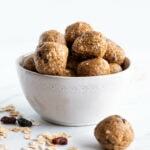 Please note this recipe includes several ingredients that contain small amounts of FODMAPs that could trigger IBS symptoms if eaten in larger than recommended servings. So, I encourage you to stick to the suggested serving size until you know your FODMAP tolerance. Using clean hands, grab a small amount of the mixture and roll into a roughly 1-inch sized ball. (The mixture will be slightly sticky.) Place the ball on a parchment-lined pan and repeat with remaining mixture. Once finished, place in the freezer until no longer sticky. Transfer to a freezer-safe container for storage. (You can store them in the fridge, but I like to store them in the freezer until I’m ready to enjoy a bite or two.) When ready to eat, let thaw (if frozen) for a minute or two before enjoying. Serving Size: For me, this recipe makes roughly 18-20 small bites. Nutrition information is based on 1/18th of the recipe. 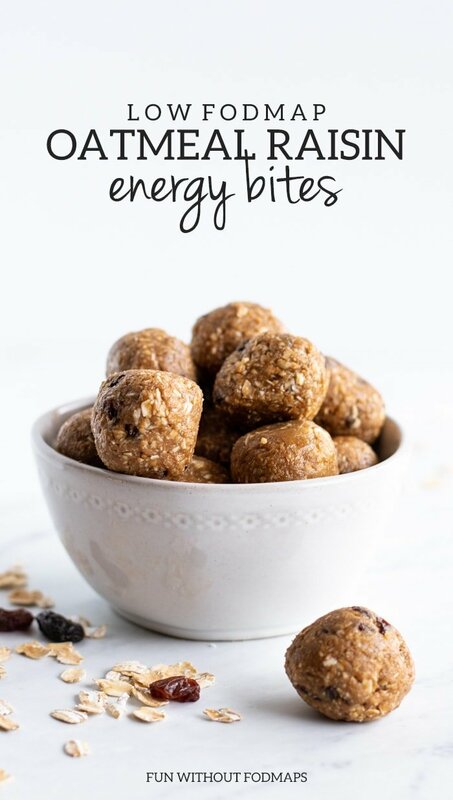 Based on ingredients, I would recommend no more than two bites per serving (or 1/9th of the recipe) until you have tested and know your FODMAP tolerance. Peanut Butter: I recommend using “natural” peanut butter made with just peanuts (and maybe salt). 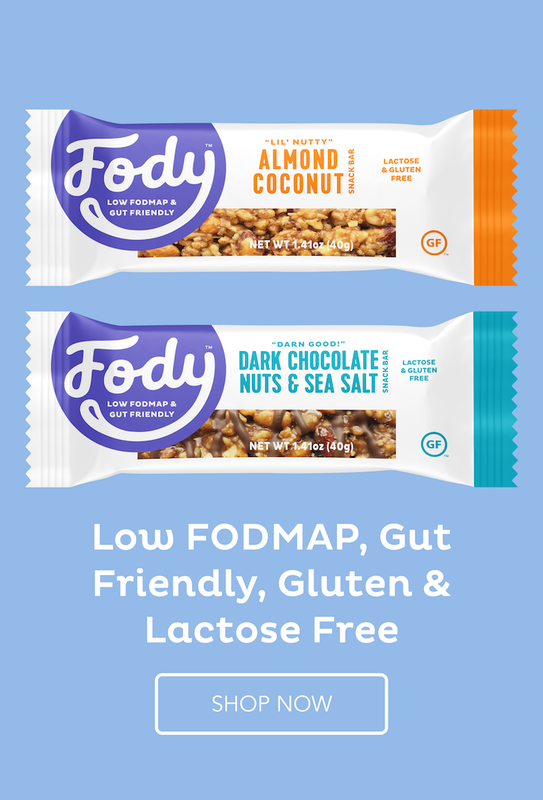 A low FODMAP serving is 2 tablespoons or 32 grams. Raisins: A low FODMAP serving is up to 1 Tbsp. or 13 grams according to the Monash app.